I’m obsessed with grilling. Its the quickest way to develop some amazing flavor and its fun to be outside! For this salad I love the peppery arugula combined with succulent steak and that bite of gorgonzola. Yum. You can make this salad outright (as it is delicious) or make it after a night of grilling when you have some delicious steak and veggies leftover in the fridge. Two for the price of one always works for me! Heat grill to medium high heat. Salt and pepper steak on both sides. Grill steak for 4-5 minutes on each side or until it reaches desired doneness. Set aside and rest. Meanwhile, brush each side of the zucchini and squash with olive oil and sprinkle with salt and pepper. Grill vegetables until tender with nice grill marks. Set aside and turn off grill. Once the veggies and steak have cooled down enough to handle, cut into large bite size pieces. 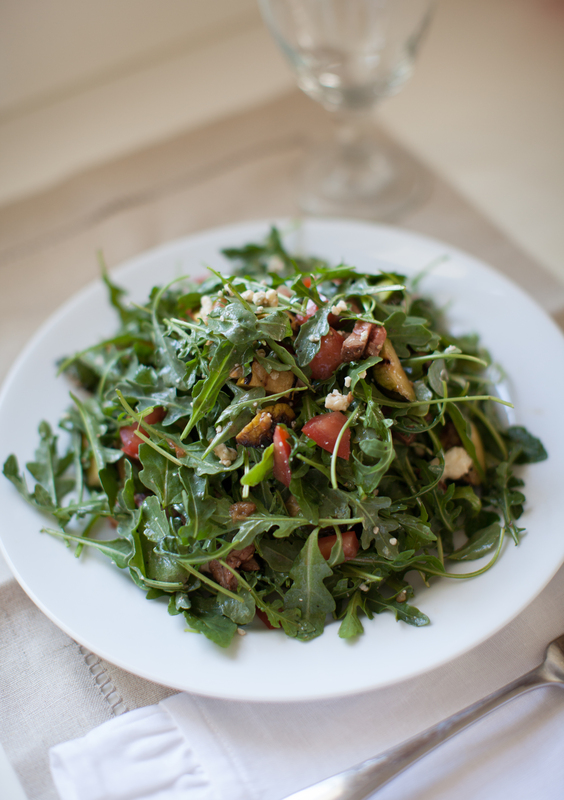 In a large mixing bowl combine arugula, steak, veggies and tomato. Top with gorgonzola. Serve with olive and balsamic vinegar. Enjoy!